For nearly three hundred years a network of standard gauge industrial railways operated in north-east England. Colliery closures accelerating in the final decades of the twentieth century ended with the total elimination of deep mining. The Sunniside to Causey Arch section of the preserved Tanfield Railway dates from 1725, making it the oldest working in the world. 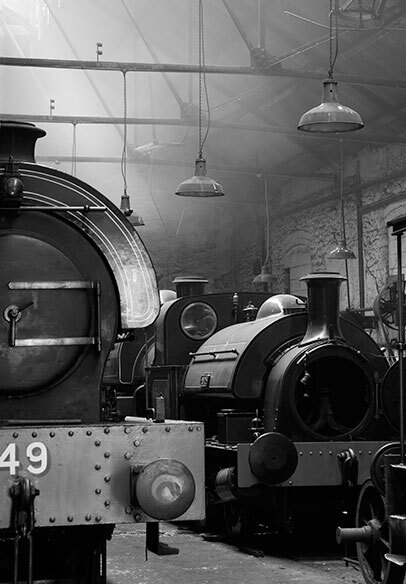 The locomotive shed of 1854 has the longest operational history in Europe. The southern terminus is at East Tanfield where new station buildings approach completion in 2015. Woodlands surround the Causey Arch built by Ralph Wood in 1726 and now the world's oldest surviving railway bridge. It once carried a standard gauge timber waggonway over which wooden chaldron waggons were pulled by horses. Coal trains operated over railway inclines linking Sunniside to coal staiths on the River Tyne. The preserved remains of the Tanfield Railway reopened in stages between 1975 and 1992. 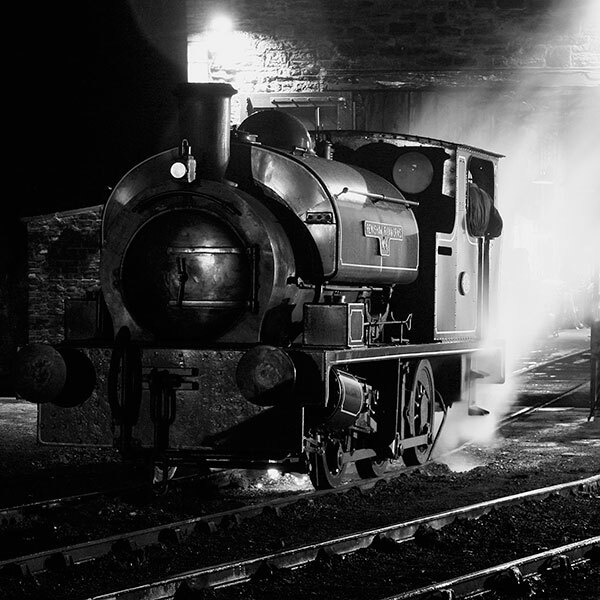 Sir Cecil A Cochrane is typical of the many small 0-4-0 saddle tank locomotives used in all manner of industrial sites across the UK in the nineteenth and twentieth centuries. Completed in 1948 at the Tyneside works of Robert Stephenson & Hawthorns it worked locally until its acquisition by the Tanfield Railway where it hauled the inaugural passenger trains in 1975. 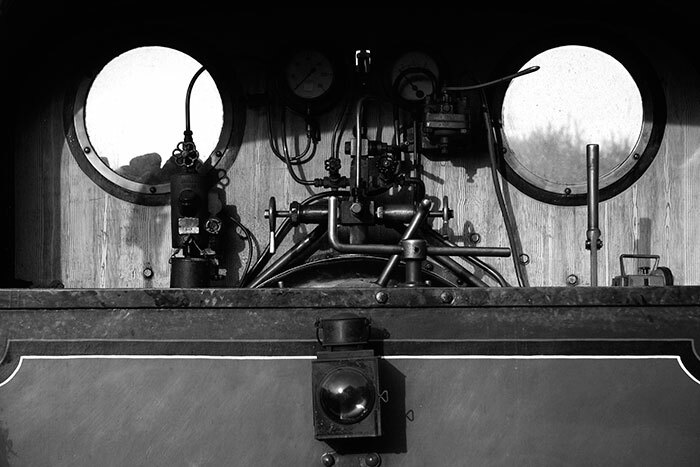 The L-shaped regulator lever controls the steam supply from the boiler to the cylinders, creating the engine's driving force. No.2 was built on Tyneside by Hawthorn Leslie in 1911. Acquired by the Tanfield Railway in 1976 it was in steam for some years before going into store. It re-entered service in 2013 following a long-term rebuild. It's another 0-4-0 tank engine a shade smaller than Cochrane. I liked this view shot in the warm light of a September evening. 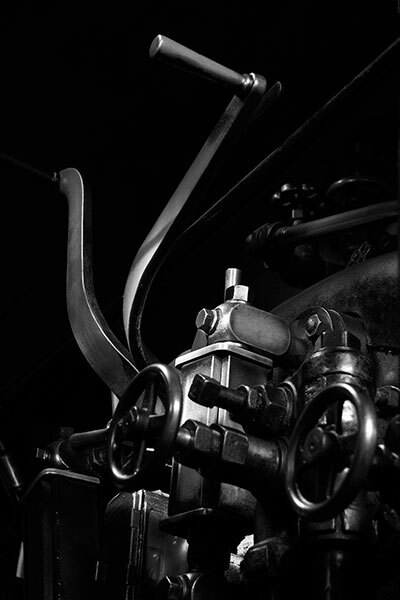 Although different in design and construction, George Stephenson's pioneering locomotives on the 1825 Stockton & Darlington Railway used the same principal of two cylinders driving four wheels through an assemblage of connecting rods. Oiling a locomotive's moving parts is a crucial routine for the crew. 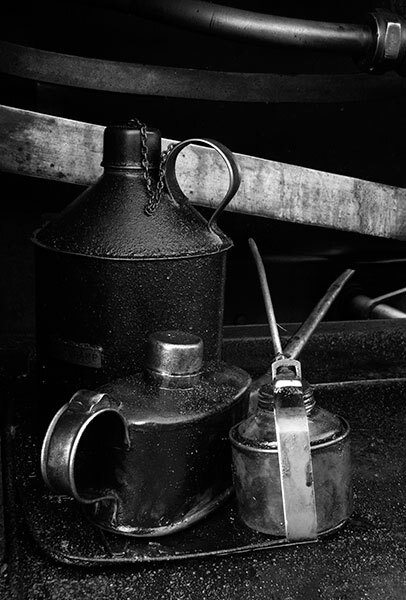 The simplest method is to use a spouted can to fill the various oil reservoirs around the locomotives at appropriate intervals. Cochrane's cans sit on the running plate in front of the cab. Renishaw Ironworks is an 0-6-0 tank engine built by Hudswell Clark of Leeds in 1919. 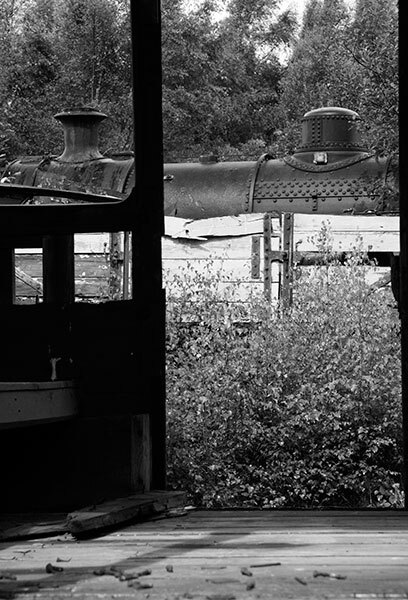 It's currently out of service and dismantled for an overhaul underway in the locomotive shed at the end of 2014. 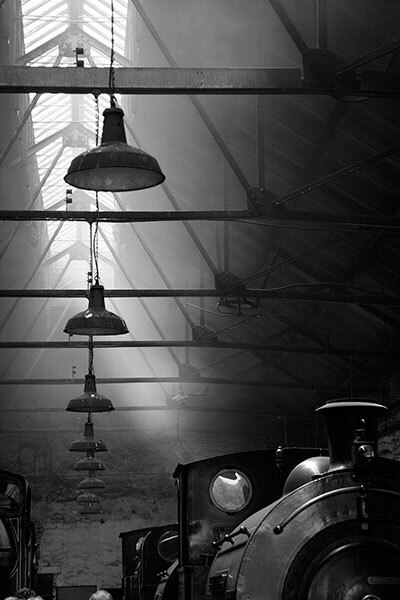 This detail recorded earlier in the year was lightly lit through a window in the engine house. The sidings alongside the locomotive buildings store engines and rolling stock awaiting a chance for restoration and return to service: others are stored undercover. Here, a narrow-gauge 4-6-2 Pacific built in1951by Robert Stephenson & Hawthorn for the Tasmanian Government Railways has returned to its homeland. It would seem a daunting task to complete even a cosmetic restoration but such railway miracles are not unusual. 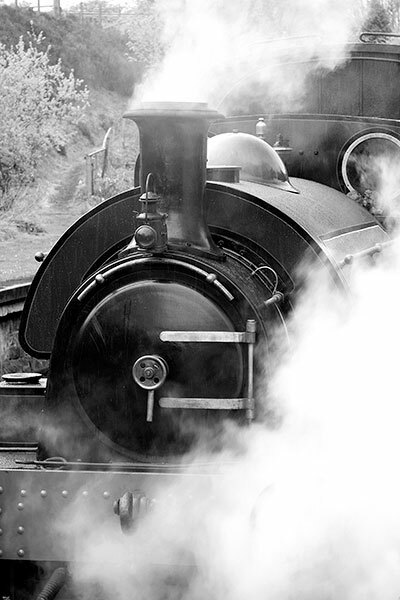 Several locomotives were in steam for the September 2014 Gala weekend including visitor No. 29. 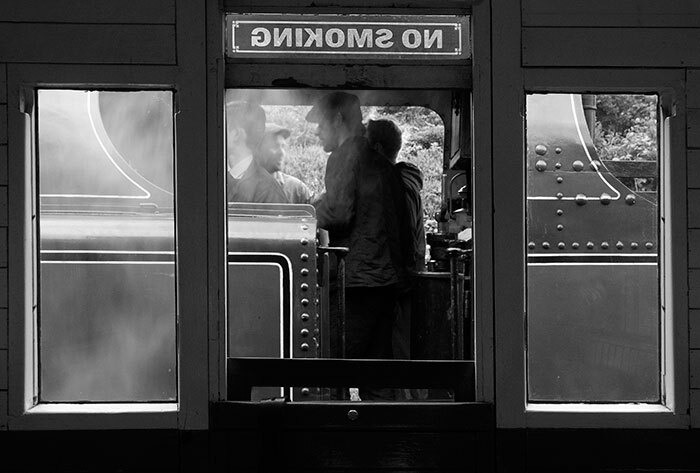 Built in 1904 by Kitson & Co of Leeds, it usually operates on the North York Moors Railway at Grosmont. Its working life was on the extensive Lambton, Hetton & Joicey Collieries railway system in County Durham. Here, two trains stand alongside at St Andrews House Station with carriage windows from one framing the cab of 29 hauling the other. The NO SMOKING sign is in coloured glass. After replenishing water and coal at St Andrews House station, No.2 and train stand ready to depart. 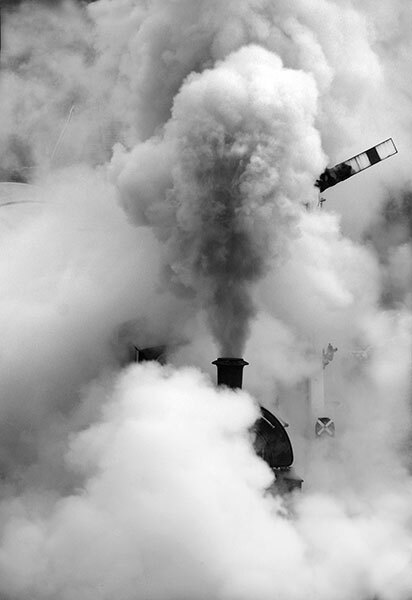 Generous smoke and steam enhance Cochrane's yard departure for St Andrews House with the first train of a new operating day. Passenger trains run on Sundays throughout the year, supplemented by a second day during the summer months. A varied calendar of special events centres on the Tanfield's industrial history. 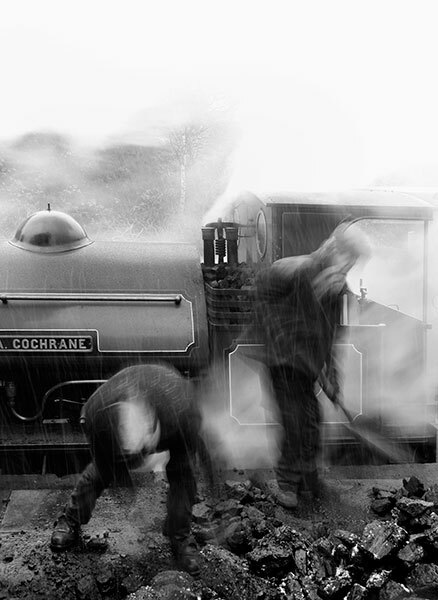 Waiting to leave with the last train on a cold February day Cochrane built a head of steam to create this special image on departure. The Tanfield Railway operates a fine collection of original Victorian era and later wooden coaches: others await restoration. Steel and timber coal wagons and a guards van operate as a colliery train. 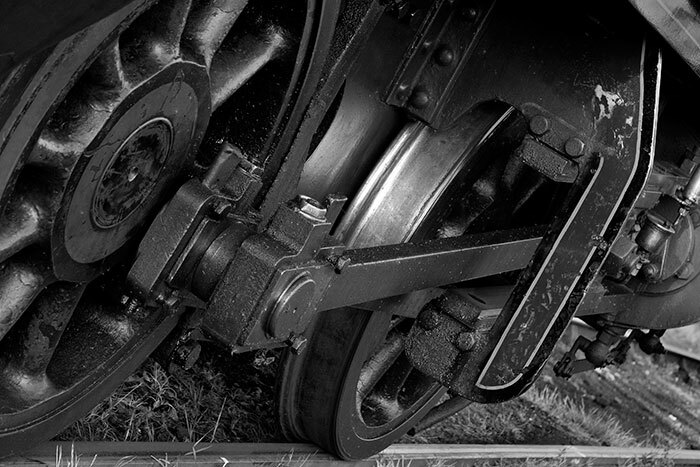 Several locomotives are under active restoration and a considerable number await possible resurrection. 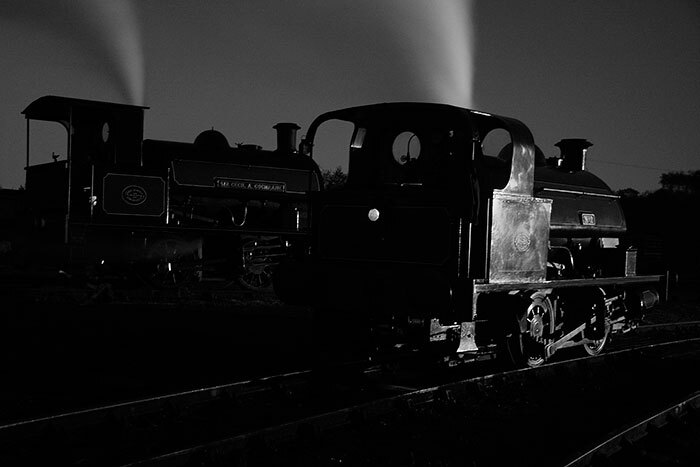 The Railway usually arranges an evening photographic session to launch their late summer Steam Gala; this, and Images 15/16, are from the 2014 event. Cochrane and No 2 stand in subdued light profiled against a clear night sky and the glow of distant lights on Tyneside. 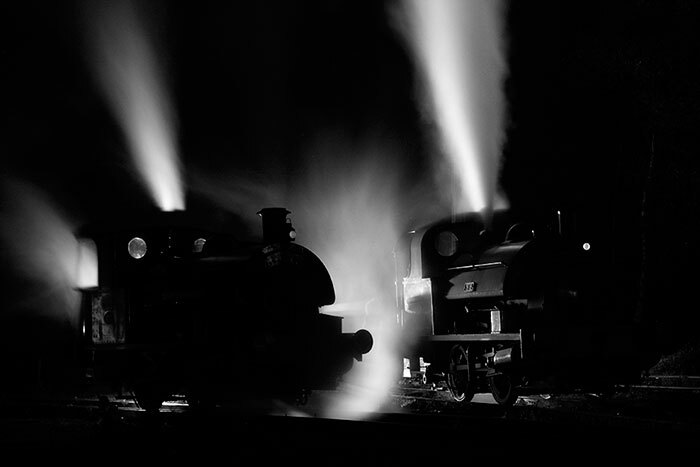 Cochrane and No.2 stand backlit in the sidings by the locomotive shed. 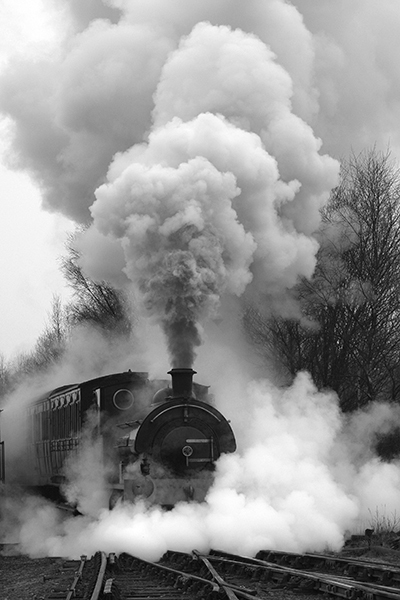 Twizell is a large 0-6-0 side tank engine built by Robert Stephenson & Co in 1891. 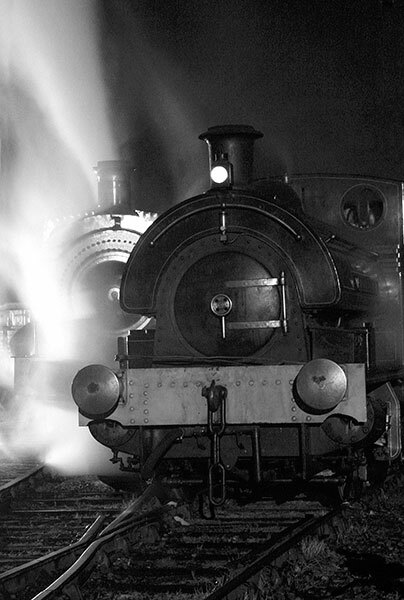 In 2010 it returned to steam finished in gleaming lined black following an extended overhaul. I liked the strong silhouette created by the backlighting. 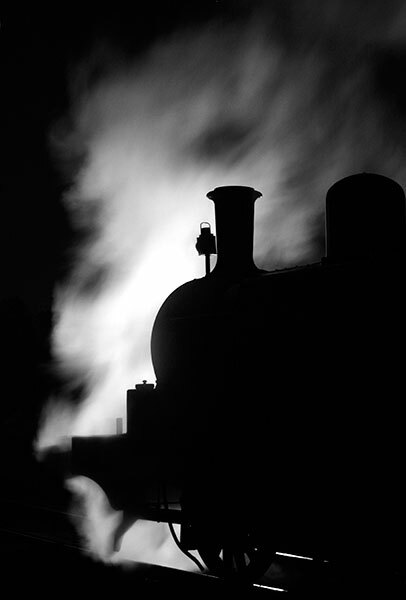 At the 2007 Gala photography session Cochrane stands in front of a visiting Great Western Railway tank engine. At the same event Renishaw Ironworks stands backlit at the loco. shed doors. 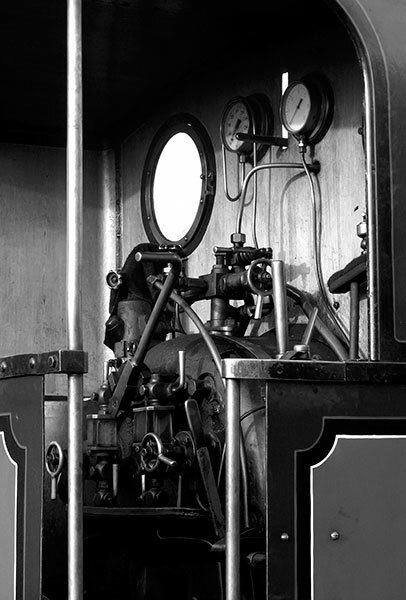 At the end of 2014 this locomotive was dismantled and undergoing a comprehensive overhaul and rebuild. Since 1975 this original colliery building of 1854 has been supplemented by similar new structures housing locomotives and stock awaiting restoration, workshops and the passenger carriage fleet.